“Anything can happen in motocross” is an old saying that easily could be used at this past weekends 450 class at Red Bud. Among the highlights were Kenny Roczen on his team HRC Honda taking his first moto win, Eli Tomac’s Monster Energy Kawasaki breaking down in moto one, an his subsequent problems in moto two, too Monster Energy Yamaha’s Justin Barcia‘s last lap pass on Roczen in moto two. 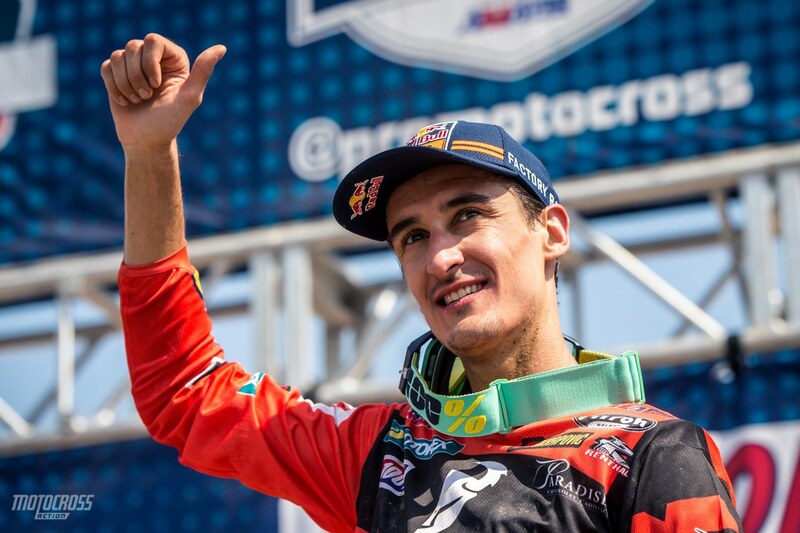 But the biggest takeaway was Red Bull KTM’s Marvin Musquin capturing the overall win and red plate. Okay, he may be only three points ahead of the amazing Eli Tomac, but this has put them back on a level playing field. I literally stopped Marvin just as he was getting into his rental car for a few quick questions. MARVIN, YOU TOOK THE OVERALL WIN, THE POINTS LEAD AND NOW HAVE THE RED PLATE. Yes, it is amazing and shows anything can happen. There are a lot of races to go obviously, but from 32 points down to now leading the championship, it is unbelievable. Overall it started off great. I had a crash on the first turn in the first moto, and was second and that is a bummer. But I recovered to get to second at the end of the moto. Then it was unbelievable winning the second moto. NOW, KENNY (ROCZEN) HAS WON A MOTO, BUT GENERALLY, IT HAS BEEN YOU AND ELI (TOMAC) AS THE CHAMPIONSHIP GUYS. Yes, for sure. Kenny rode well today, and I was able to get him in the second moto. Obviously I couldn’t catch him in the first one with the crash in the start. But I fought really hard in the second moto, and that was awesome to see him up near the front. IS IT DIFFICULT TO NOW THINK ABOUT POINTS IN THE SITUATION YOU ARE IN? No. I mean I was 32 points down before the weekend, and just trying to win races. So, still the mindset is the same. We do our best, and try to gain points every time. 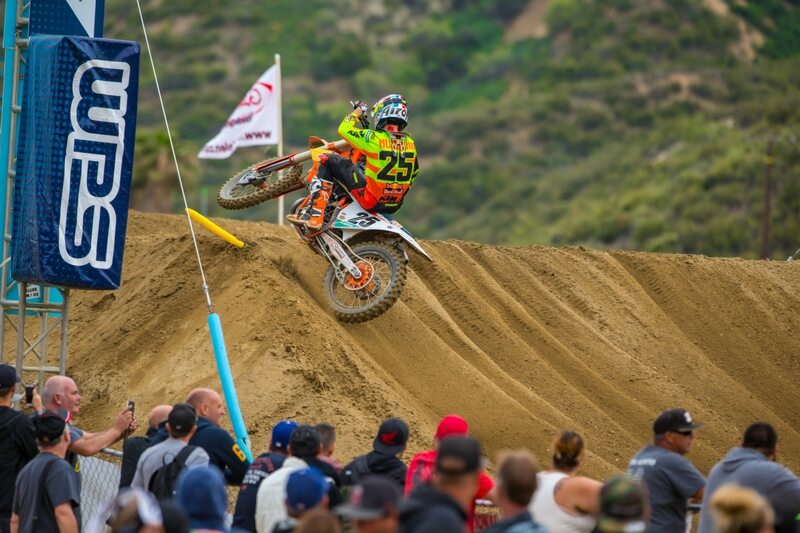 HOW DO YOU FEEL ABOUT THE UPCOMING TRACKS LIKE MILLVILLE, AND WASHOUGAL? 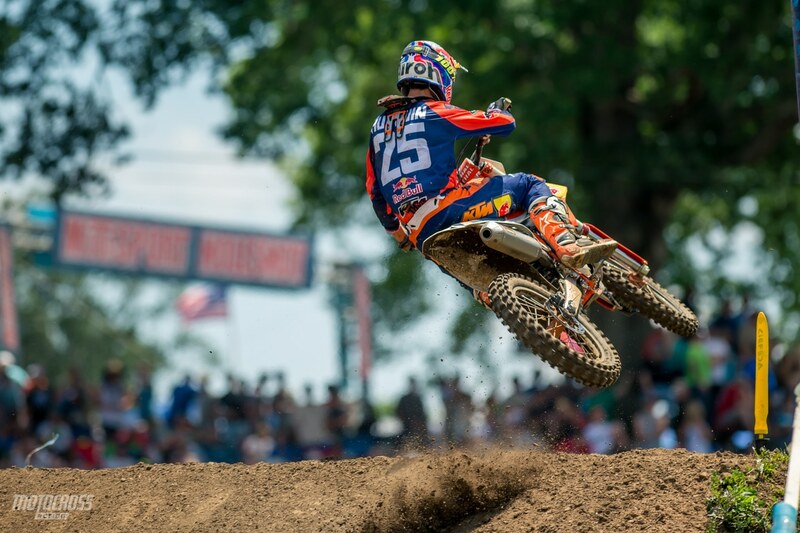 Millville is awesome; actually they’re a lot of good ones coming up. Last year, I did really well at Millville and Washougal, so I am looking forward to them. For sure, it (Millville) is one of the best tracks. YOU NOW HAVE A RARE WEEKEND OFF, WHAT WILL YOU DO? We will stay home. Usually we travel so much, so on weekends off we stay home and relax, and just train extra hard.